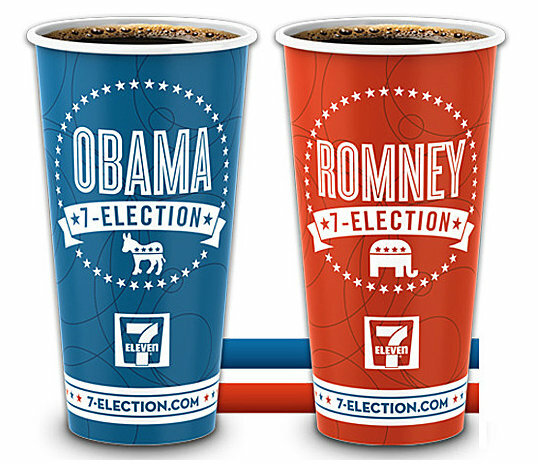 7-Eleven is once again running their "7-Election" in which coffee drinkers indicate their candidate by which cup they choose. 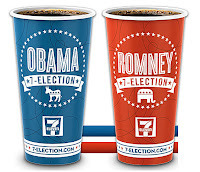 As of Wednesday, Sept. 26, the president holds a commanding 16 percent lead in the popular vote, collecting 58 percent of cups compared to 42 percent for the former Massachusetts governor. And the news isn’t better for Romney when it comes to an electoral-style map, as he holds a lead in only four states: Idaho, New Hampshire, South Carolina and West Virginia. North Carolina appears to be tied at this point. Reading the World Net Daily comments on this story you'll learn that 7-Eleven is entirely owned and staffed by communists and Islamists who are faking the results of their promotion.